I have the Axanar Defense Motions in Limine. As I have stated before, these documents are lengthy and numerous. I will try to keep my analyses brief. As always, I have paid for these documents; they are a matter of public record. All members of the public (e. g. you and me) have the right to know. Furthermore, if I miss anything or go over it too quickly for your liking, please feel free to send me a note at the Contact page and I will try to answer you soonish. However, in case you didn’t read the last blog post: what the hell is a Motion in Limine, anyway? Basically, a motion in limine is an attempt by one side to exclude evidence from trial. Because there are a several of these, I’ve already handled plaintiffs’ so now we are onto defense’s motions. Many of the same supporting case law shows up from motion to motion. Hence we will instead look at what the motions have targeted for exclusion. Furthermore, many of them come with proposed orders, which the judge can accept, reject, or alter. Unless anyone really wants to see any of those, for the sake of brevity I won’t include them. While these documents may go under seal now, I suspect that, if this matter heads to trial, some will end up revealed anyway. Because business plans in particular would go to the question of willful infringement. Hence it becomes, properly, a question for the trier of fact (the jury). And then this motion seeks to preclude evidence concerning discovery violations. And this one seems to favor defense, for they are correct that they were never sanctioned for defendant Peters and witness Burnett not producing certain documents. In addition, this motion seeks to preclude evidence not disclosed in a timely fashion under the court’s scheduling order. However, this motion makes nearly the opposite argument as the one made for motion #1. Because in motion #1, their client didn’t produce documents at all. And in motion #2, they seek to exclude documents provided (according to defense) late. However, just as there are no sanctions referenced in motion #1, there are none in motion #2. Or to put it in laymen’s terms, this is an attempt to have one’s cake and eat it, too. And I have no doubt that defense knew this meant the list was not to be considered all-inclusive. And then this motion seeks to preclude plaintiffs from “relying on evidence regarding items that are unoriginal, in the public domain, or from third parties”. However, aren’t unoriginal elements kind of the point of the case? Actually, defense means geometric shapes, scènes à faire (scènes à faire are the kinds of scenes we expect in a genre, such as a kiss in a romance or a gunfight in a western. They cannot be copyrighted), etc. Except what they claim to be scènes à faire, etc. are really questions of fact, more proper for a jury to decide. Hence I doubt this one will be granted, at least not in full. What’s the test for this kind of information? Now, the question is whether the probative value of the evidence is outweighed by any prejudice to defendants. And the bottom line is that there are just some things which Gossett and McIntosh in particular are the best if not only witnesses to. Furthermore, witnesses and parties aren’t required to like each other. And not liking someone does not necessarily, by definition, lead to perjury or irrelevance. In addition, on page 8, defense wants plaintiffs to not be able to introduce evidence of the former relationship between defendant Peters and Ms. Kingsbury. While I agree that their love lives are not relevant, this may come out all the same. For one thing, on the Axanar ‘Annual Report‘, Ms. Kingsbury’s salary is listed as being ‘deferred’. Yet she will (I suspect) be asked about the hours she put into the project. And then she may be asked why she was putting in so many hours without compensation when she apparently did not have a regular day job. Because the answer may very well center around her former relationship with defendant Peters, this may come out anyway. I doubt this one will fly, simply because the extant script from the time the lawsuit was filed is the one that matters. infringed Plaintiffs’ copyrights, or any other related issues. Except personal benefit cuts to the heart of this case, and so does willful infringement, both of which could be neatly shown with information on a diversion of funds to personal expenditures and/or to the creation of a fledgling future business. While defense tries to claim the name would solely refer to trademark infringements (which are not at issue herein), I hate to break it to ’em, but all of those pictures of Klingons, Constitution class starships, delta shields, and Vulcans (not space elves! Sheesh) will kinda tip off the jury anyway. After all of the touting of how ooh-aah awesome Prelude was supposed to be, now defense suddenly wants the plaintiffs to shaddap about that. Except quality could go to brand confusion, an element in damages. Sorry, defense, but I don’t think this one’s going to go your way. So this defense counsel declaration works as a vehicle for exhibits like most such declarations do. So this exhibit consists of the April 21, 2016 defense request for production directed to Paramount. This matter was covered on the G & T Show blog and I won’t duplicate my efforts here. And then this exhibit consists of the same RFP as in Exhibit 1 except it was directed to CBS. Furthermore, this exhibit consists of plaintiffs’ Plaintiffs’ Rule 26 Initial Disclosures. The main points of interest surround the witness list for depositions. These include names such as defendant Peters, Mr. Burnett, Mr. McIntosh, and Ms. Kingsbury. In addition, this exhibit consists of Defense’s Responses to Plaintiffs’ First Set of Requests for Production of Documents. And defense objected to pretty much everything, claiming either irrelevance, vagueness, or that a request was overly broad and/or burdensome. Finally, this exhibit consists of a Portion of the Videotaped Deposition of Bill Hunt. Mainly, this excerpt refers to multiple versions of the script. And then this request attempts to “preclude plaintiffs from relying on evidence regarding items that are unoriginal, in the public domain, or from third parties.” So this parallels the Motion in Limine #4. Nearly all of the following exhibits have come up before, on April 5, 2016 in a (you guessed it) Defense Request for Judicial Notice. Hence I won’t comment much. However, I will point out that references to Wikipedia are often discounted because that site can be so readily altered, and dictionary definitions can differ among dictionaries and one treatment is not necessarily definitive. So Exhibit A consists of a page about the meaning of the name Soval from a site called Kidpaw. And then Exhibit B consists of the Wikipedia entry on the name Garth. Furthermore, Exhibit C consists of the Wikipedia entry on Epsilon Bootis. In addition, Exhibit D consists of a Nosferatu screenshot. Nosferatu, who looks exactly like a Vulcan. If you’re on crack. Finally, Exhibit E consists of the Merriam-Webster dictionary definition of the word elf. ‘Tis the season, and all that. So Exhibit F consists of Merriam-Webster dictionary definition of the word Vulcan. And then Exhibit G consists of a discussion about triangular medals. Furthermore, Exhibit H consists of an excerpt from the Odyssey of Homer. In addition, Exhibit I consists of Merriam-Webster dictionary definition of the word Rigel. Finally, Exhibit J consists of Merriam-Webster dictionary definition of the word Terra. So Exhibit K consists of a comparison between the flag of the United Federation of Planets and the UN flag. 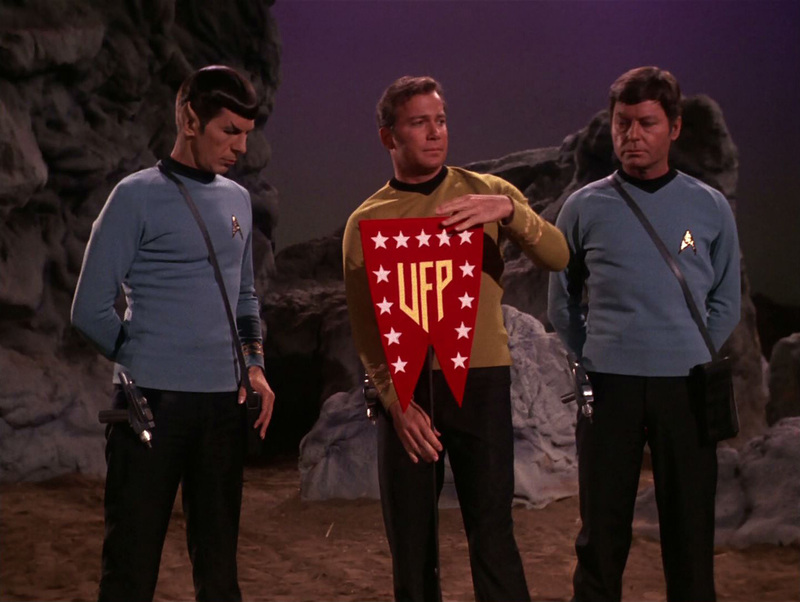 While there are clear stylistic similarities (and color), that’s not the only UFP flag ever used in the series. However, I’m sure expert super fans would know this without my having to so much as mention it. And then Exhibit L consists of Merriam-Webster dictionary definition of the word teleportation. Furthermore, Exhibit M consists of a copy of Sten Odenwald’s article, Who Invented Faster Than Light Travel? In addition, Exhibit N consists of Merriam-Webster dictionary definition of the word federation. And next, Exhibit O consists of a copy of an excerpt from H.G. Wells, The War of the Worlds. So Exhibit P consists of Merriam-Webster dictionary definition of the word bridge. And then Exhibit Q consists of the Wikipedia entry on “Whom the Gods Destroy” (Star Trek: The Original Series). Furthermore, Exhibit R consists of a Wikipedia entry on “Whom the Gods would Destroy”. In addition, Exhibit S consists of a Wikipedia entry on “The System of Doctor Tarr and Professor Fether”. This story by Edgar Allan Poe tells of a lunatic asylum. Tellingly, even the Wikipedia entry doesn’t list any Star Trek episodes as having been influenced by it. Finally, Exhibit T consists of a copy of “Is ‘those whom the gods wish to destroy they first make mad’ a classical quotation?,” via the blog of Roger Pearse. #SpoilerAlert: Pearse traces the expression back to the 17th Century. Finally, this document is just a proposed order referencing all of the motions, supra.